Crooks chase cops! Cats have puppies! Hot snow falls up! Don't you think that the vaguely feminist 'They've got the right idea, eh girls' implication is ever so slightly undermined by that exclamation mark? If you must know, I shot a librarian. But I did not shoot a deputy librarian. Or so it seems to me. Maybe it's just my guilty conscience. Pieces of advertising material that have recently annoyed me - part six of at least nine. Would you now. So, Chris Addison's ugly cousin, you've been wanting to start a superband for a while, have you, but what's held you back is that the only way you can think of to contact 'all the musicians you know' is by text; and you're not prepared to go to that expense unless, in some utopian dream-world, a phone company gives you free texts for life. You see, I worry that you might not quite have the drive it takes to succeed in the music business. Also, surely you can't start with a superband? You have to have a band first, you can't skip straight to 'superband'. Unless they missed out the space, and he's actually planning to start a super band. With topping drums, and spiffy guitars. I do hope so. Muttonchops and parrots: for those of you who like your Earls of Aberdeen a little racier. I promise this marks the end of Lord Aberdeen week. More eminent scholars than I have been looking into the whole question of Lord Aberdeen's father-in-law and that dog he invented. So let us instead now briefly examine Lord Aberdeen's great-great-grandfather, and his grandson. Our Lord Aberdeen, John, and his wife, who called themselves 'we twa', seem to have been beloved wherever they went, sent off by Queen Victoria around the Empire like benevolent supernannies, jollying Ireland along here, inventing brigades of nurses for the Canadians there, and generally adding to the gaiety of nations (although along the way, it seems, spending the family's money like water, especially on fruit farms and pageants, two things to which her Ladyship seems to have been particularly partial). "During a stop-over at the Stafford Arms in Wakefield, he was so pleased with the mutton chops served for his supper that he demanded to see the cook. Thus he met Catharine Hanson, a handsome woman of 29 and immediately led her to his bedchamber. When the time came for him to return home, George could not resist the temptation to again sample the delights of the Stratford Arms. This time Catharine had a surprise for Lord Aberdeen. Faced with a loaded pistol and the choice of marriage or his life, George pragmatically decided the Gordons of Haddo would benefit from an infusion of English blood." "This consisted of asking girls who seemed as if they might be enthusiastic amateurs - out-of-work actresses or married women with husbands away at the war - if they would like to come to a party. If they then showed signs of enjoying themselves, it would be suggested that they continue to do so for money." His wife Anne, according to the obituary, 'regarded her husband's interest in sexual matters with tolerant amusement' and 'decorated their home with her colourful flocks of parrots.' That's what I call a wife. I now promise not to go on about any other Lord Aberdeen. Not even Lord John's grandfather: the Prime Minister who took Britain into the Crimean War; or the current incumbent, Lord Alastair's son Alexander, and his ill-fated tank-driving business. You can have too much of anything, even Lords Aberdeen. So, yesterday I was grossly unfair to John Hamilton-Gordon, seventh Earl of Aberdeen. 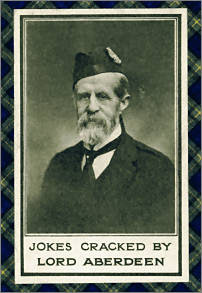 I went through the whole of 'Jokes Cracked By Lord Aberdeen', and deliberately selected the one that has aged least well in the last hundred years or so. So today, by way of atonement, here is his Lordship's best joke. Seriously, I really like this one. Pretty good, eh? And surprisingly cruel. Modernise the language and references, and Jimmy Carr could use that today. Not that I'm saying that's necessarily the highest accolade in comedy, but not bad coming from a late Victorian Governor General of Canada. The Laird ruminates over whether he's better off sticking to his tight ten minutes tonight, or trying out some of his new stuff on the second Home Rule bill. Obviously, you have to read it in the voice. However, another thing the British Library do is allow you to order almost any book ever printed in Britain (that is the main thing they do). So anyone sufficiently intrigued by the material of nineteenth century Scotland's premier aristocratic comic can nip up to the reading rooms, and order it up. Which reminds you, have you heard this one? *tap* *tap* Is this thing on? Oh, come on! He'd souppit him! Through the Hoose! Because, he had been associated with Presbyterians in his former abode, but now.... oh, never mind. Tough crowd. Times when apostrophe contractions, though normally so useful, are probably best avoided. I'm what I'm, and what I'm needs no excuses. I think anyone going by the evidence of that box alone would have to conclude that our flat is shared by Ernest Hemingway and Milly Molly Mandy. And is that so very far from the truth?